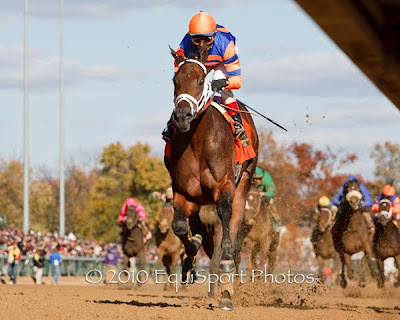 Turf & Dirt - On Horse Racing: The "Derby Trail"? Really?... um, it's snowing out! The "Derby Trail"? Really?... um, it's snowing out! Well what else are you going to do when it's 20 degrees and snowing. It's a great time to update the Derby and Oaks list! And keep the woodstove burning! The 2 year-olds will soon be 3 year-olds, and a few have already stamped themselves as legitimate horses. It's WAY too early for preditions, but this is a good "Watch List". Uncle Mo definitely stamped himself as one to watch in winning the Breeder's Cup Classic. We could only ask that his owner act as classy. One almost felt embarrassed for the normally stoic Todd Pletcher after the race as Mike Repole planted a handful of wet ones on Todd's cheek. Repole did rebound nicely by donating $30K to Thoroughbred Retirement organizations. If nothing else, the Vitamin Water gazillionaire is entertaining. Maybe Pletcher can at least temper Repole. Can you imagine if the New Yorker had hooked up with Rick Dutrow? Wow...me either! 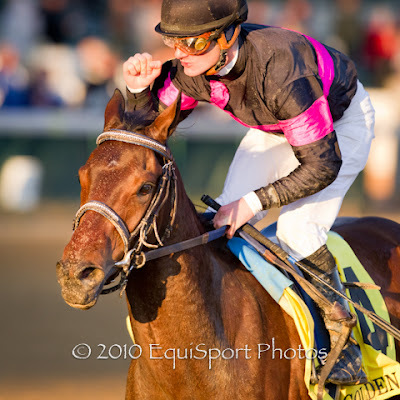 Look for Uncle Mo to run back in The Tampa Bay Derby, on March 12, or less likely, the Gotham on March 5 at Aqueduct. On the distaff side, I was most impressed with the way Kathmanblu dispatched the field in The Golden Rod Stakes at Churchill Downs November 27th. A Kenny McPeek trainee, Kathmanblu was never threatened, coasting across the line for an easy 8 1/2 length win. In a rare show of jubilation, Julien Leparoux knew he was Ky. Oaks bound with this talented filly. Look for her at Gulfstream in late February or early March. Okay, those are my 2 favs to watch at this point. In addition, I liked how "To Honor and Serve" won the Remson, and I like "Santiva", winner of the Ky. Jockey Club. Of the other talented fillies, "Awesome Feather" beat a class field in the Breeder's Cup and the undefeated "Turbulent Descent" looked great yesterday in the Hollywood Starlet.